This book is Winner of the Samuel Johnson Prize for Non-Fiction 2014. It was shortlisted for the the Costa Biography Award 2014. As a child, Helen Macdonald was determined to become a falconer, learning the arcane terminology and reading all the classic books. Years later, when her father died and she was struck deeply by grief, she became obsessed with the idea of training her own goshawk. She bought Mabel for GBP800 on a Scottish quayside and took her home to Cambridge, ready to embark on the long, strange business of trying to train this wildest of animals. 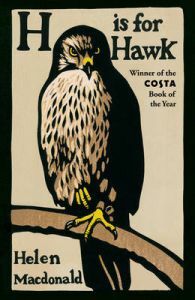 H is for Hawk is an unflinchingly honest account of Macdonald's struggle with grief during the difficult process of the hawk's taming and her own untaming. This is a book about memory, nature and nation, and how it might be possible to reconcile death with life and love. Helen Macdonald is a writer, poet, illustrator, historian and affiliate at the Department of History and Philosophy of Science at the University of Cambridge. Her books include Falcon (2006) and Shaler's Fish (2001).